Imagine my surprise, digging through the garden, when suddenly the beast of Bentleigh emerges from the soft earth. 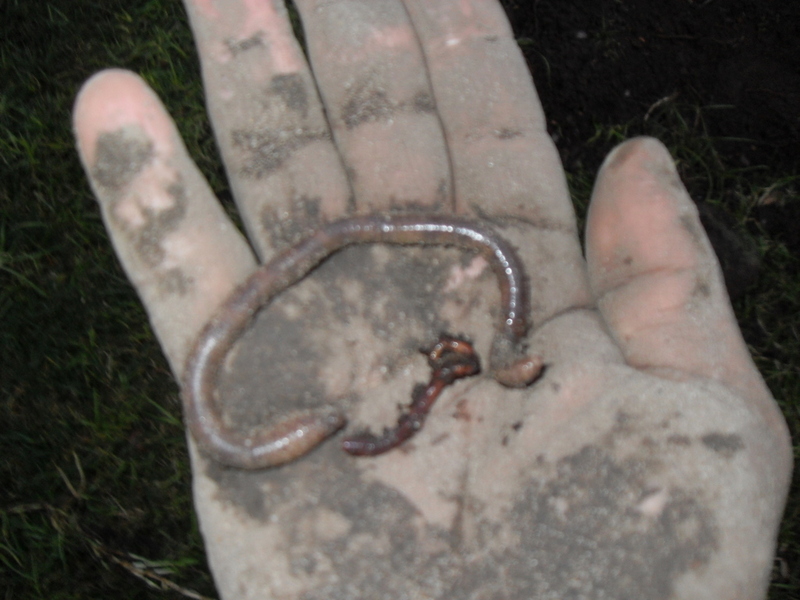 It is easily the biggest worm I have held, and in the photo below you can see the beast along with a typical compost worm. No maybe not as impressive as the Giant Gippsland Earthworm, which includes at no additional charge the comforting voice of David Attenborough. So what attracted the beast to my humble plot? It must have been all the coffee grounds that I’ve been sprinkling around the place, it’s like a magnet I tells you, like a magnet! Now as for the rest of the story, that is for another time. But if you hear a dulled and mighty roar from a place far and deep away, think kindly of the beast, who is working hard to help bring life to our soil. It seems that Mega Worm was not alone, because I also came across a large Worm feeding on coffee grounds and various other amazing natural materials. Earthworms in the garden are a sign of soil health, and this in turn will give you healthy productive plants. I suspect there are many more mega worms in the backyard, and I with them long and productive lives in my garden. Tags: coffee grounds, Earthworm, Giant Gippsland Earthworm, worms. Bookmark the permalink. All hail the mighty worm! I, for one, welcome our new compost worm overlords! Best wishes on your Earth-friendly endeavors! Hail to the lowly worm who does so much for us. Great blog. Thank you Diane. I noticed that you specialise in Feng Shui, and have services for landscaping. Are there any tips for a more attuned vegetable garden?